Ruffed grouse, Fort St. John, British Columbia, CA, 2009. Courtesy of Wikimedia Commons. 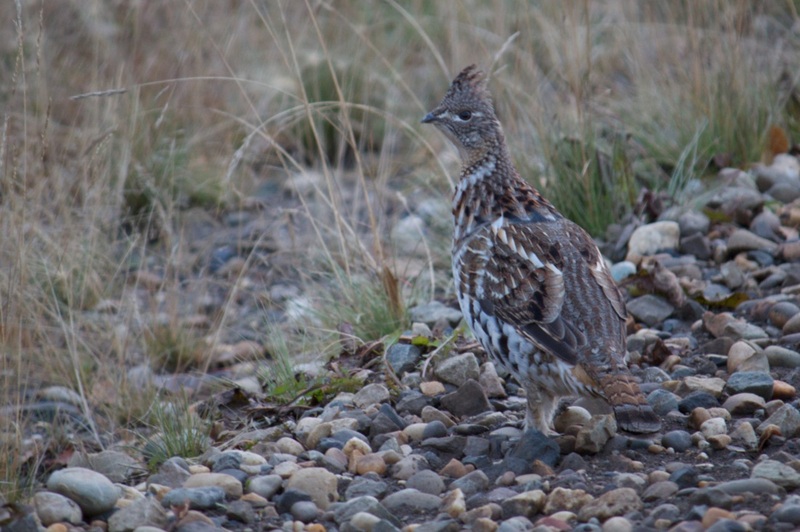 Ruffed Grouse male drumming, Yellowstone National Park, May 2014. Courtesy of Wikimedia Commons. This dove-sized bird is mottled overall with browns, russets, grays, blacks, and whites. Generally the black and white occur on a brownish background. The bird has a slightly tufted head. The "ruff" for which it's named is a dark brown patch of feathers around the neck area. Males and females are very similar, but females have a broken black stripe across the tail, while the male has a solid black stripe. 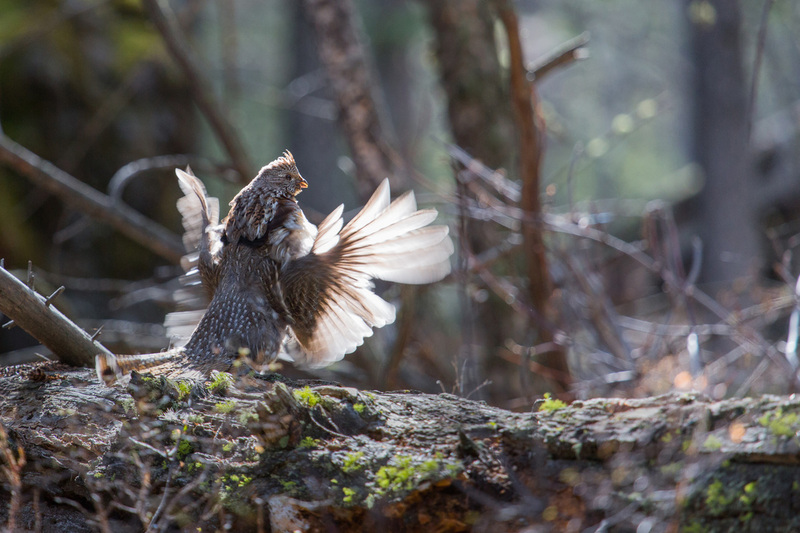 The ruffed grouse generally forages on the forest floor, strutting along the ground to find nuts. However, it also lights in trees to consume a favorite food-- twigs and buds from aspen, poplar, and other species common to early successional habitat. This bird is unusual because can digest material with high cellulose content, except for a brief period early in life when it consumes mostly insects. Males make a famous drumming sound during mating season. The birds nest on a forest floor. Probably food and cover rather than nesting sites. Interestingly, the ruffed grouse was observed at SBG in spring near the Woodland Garden, which indeed features aspen and birch trees. The ruffed grouse stays in Pennsylvania year-round but is probably more likely to appear in the SBG habitat in fall through spring.